Usually blooming for a duration of two weeks, lilac flowers of the lilac bush come in color varieties that span the spectrum. Lilac bush foliage is green throughout different varieties, but blooms can display in cool (appearing cold to the touch), warm (appearing hot to the touch) and neutral (tones with a desaturated appearance and little temperature implication) colors. Lilac bushes that come in a variety of cool colors include bushes that display flowers in tints and shades of violets and blues. The color "lilac" is a light violet color. The species known as Chinese lilac (Syringa chinensis) displays fragile purple/lilac flowers that bloom in the middle of the month of May. The bush grows to a height of 8 to 15 feet, according to the University of New Hampshire Cooperative Extension. Common lilac bushes (Syringa vulgaris) that appear in cool colors include Albert F. Holden in deep violet flowers, Alphonse Lavallee in a blue color, De Miribel in violet with light violet borders, Olivier de Serres in lavender-blue flowers and Wonderblue (also known as Little Boy Blue) in sky blue flowers, according to the Michigan State University Extension. Lilac bushes that come in a variety of warm colors include bushes that display flowers in tints and shades of reds and pinks. 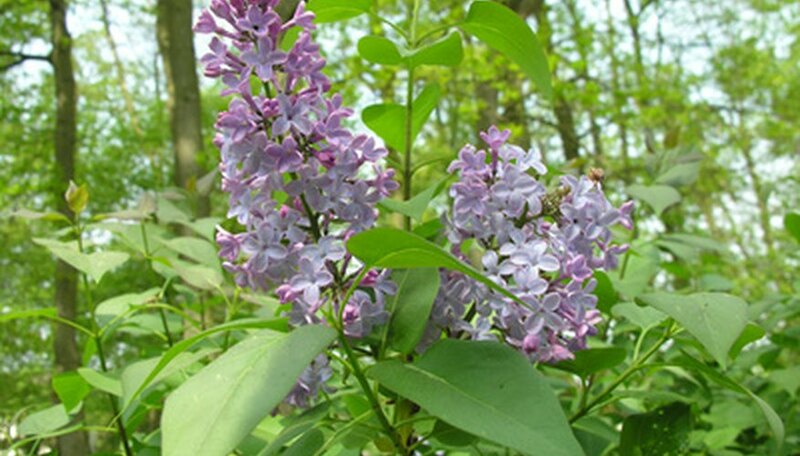 Common lilac bushes (Syringa vulgaris) come in many cultivars of different hues. This species generally reaches a height of up to 15 feet with a potential spread of 10 feet. Warm-colored varieties include, but are not limited to, Anabel with pink flowers, California rose with rosey pink flowers, Clyde heart in magenta with red buds, Congo with dark red flowers and Letha E. House with pink flowers, according to the Michigan State University Extension. Lilac bushes that come in a variety of neutral colors include bushes that display flowers in colors like creams and whites. For example, the lilac bush species referred to as Chinese tree lilac (Syringa pekinensis) displays flowers in a creamy hue. This neutrally colored lilac bush blooms in May to June and grows to a height of 15 to 20 feet, according to the University of New Hampshire Cooperative Extension. Additionally, the species known as Japanese tree lilac (Syringa reticulata) produces flowers in white, growing up to 25 feet in height and blooming during the month of June.